Here's over an hour of raw unedited crane removal footage . Go ahead and tell me what Im doing wrong . I need to perfect this crane game anyways . Edit : thanks everyone for not being assholes and volatile . I was hesitant posting the here. No regrets . I'm going to watch that on the TV when I get home. I got Youtube addressed saved on my phone. The communication between you and the crane operator was great. It looked like his ball and your center of gravity were off a few times but most of the picks and cuts went well. Of course the goal is no movement but not every pick works perfectly. Obviously the first pick was to big for the space in the canopy and would have saved time if it had just been taken in two picks. I'm sure you have watched the video a few times already and have seen where you might have made some different choices, all lessons for the next job. Nice job overall, and thanks for putting up the raw footage. We can all learn more and seeing other peoples great, good, or questionable picks is always an opportunity to improve our own mental toolboxes. Your knots scare the hell out of me. Rewatch the video and look at the knot on your carabiner, maybe it's just the video but it looked tied wrong. It may just be that I couldn't see the clear path of the cordage as it went around. The others were your balancer knots or lack of anything I recognized. Your ground guys must go insane trying to figure out what you sent down to them "this time". Pick a knot or two and be consistent, it will make the job go faster once the picks hit the ground. Just my thoughts from the luxury of my couch and the rewind button. Looking good, you’ve progressed quite well from when you posted your first videos here, only get better and better with each job, only a few small things, grab one of these for your tie in, https://www.arborist.com/product/S190195-16/Strap-to-Crane-Lanyard.html?cid= it’s rated and labelled. Quick, easy and reliable. Been using it since 2016. One of my pet peeves is using a 200/201 T for crane work, start with at least an 18” bar, 2 261, 026,550. Move up from there, That way it’ll give you more bar and power to make your cuts with more authority. That’s just a preference and owner of a crane just makes more sense to me. Other then that learn from each job, tree etc. Keep up the good work and stay safe! Oh Yeah good eye Frank, I was going to ask Trevor about that one near the beginning looked like you were going to do a cow hitch, then you started wrapping it around and around.Stay with the cow hitches for your brush picks, you can tuck the tail of the rope wherever you see fit as long as it’s out of the way. Thanks you kindly for your input. I appreciate it greatly ! This could be one of the best threads of the year - an hour of footage and a bunch of climbers commenting! Thanks for posting, Trav! Lol. That's why I waited so long. Nobody likes a Monday morning quarterback, and it is a fine line between helpful comments and being an a$$. Thanks for posting. I appreciate you not editing out imperfections. I'll learn a lot from this vid and the comments. Your welcome . Its Not easy to post something like this but in all reality its a good thing and I wish I had it to learn from. Can you elaborate? I don't have experience with either. I see shackle versus girth hitched ring sling and I want fewer moving parts, all else equal. Does the shackle take the place of the shackle that is already on most cranes? Does it attach atop the crane shackle? Is there a wire in the pin that needs installation each time you set it up? Do you have a crane, or do you rent a crane and op? Are there any advantages to the T'S model? Just re-read your post, @deevo , and note that you own a crane and use it daily. Is the shackle installation a drawback for someone like me who rents a crane occassionally, and there is already a shackle above the ball? Or someone like @Travor who rides different cranes? No I wouldn’t say drawback at all but if your using cranes a lot I like knowing where hardwares been used and stuff. Peace of mind really. I have no problem setting my friction saver in my friends bigger cranes shackle when I need them but friction savers stamped and rated, don’t have to worry about using steel wire backing up pins etc. That’s also peace of mind, If for some reason something happened and OSHA, here ministry of labour-inspected a homemade sling or something not stamped or rated well there’s another mess to deal with. I'm not a fan of the treestuff crane tie in point. This is what we use (the multiple shackles is just to extend the friction saver to the proper place). You could just use a longer friction saver. The reason I prefer the shackle attachment is it can't be cut or damaged by the crane...easily. 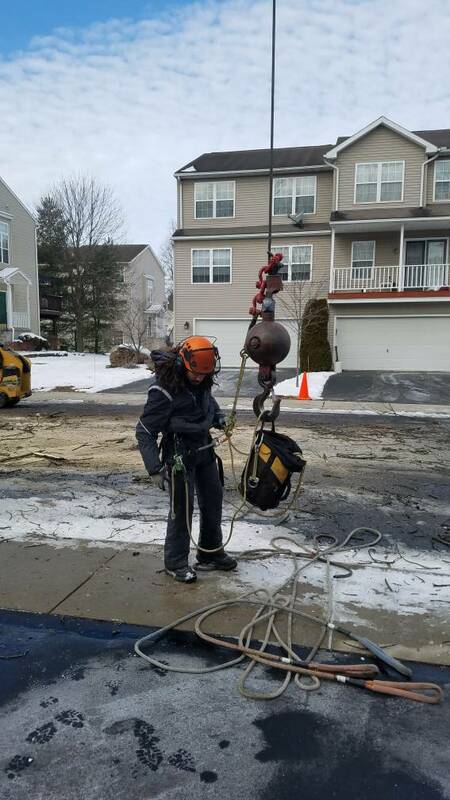 If the crane operator over lifts the ball, a rope connection (that is cinched around the cable) could get damaged by the crane's cable guide and/or the block that warns when it it over lifted. The shackle connection also keeps any rope/webbing away from cable grays, grease, etc.